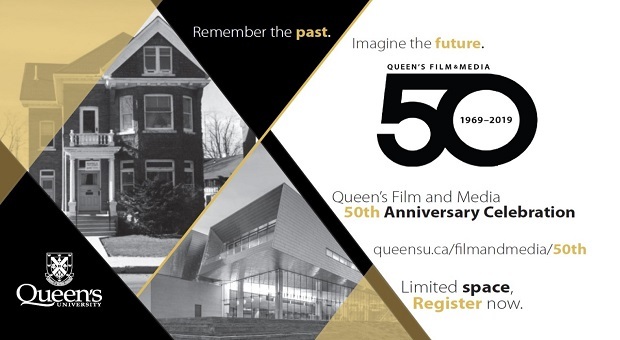 Join us to celebrate the 50th Anniversary of Queen's Film and Media! You're invited to join our current students, alumni, past and present faculty and staff in gathering together for the Department of Film and Media's 50th Anniversary Celebration! Join us for presentations throughout the weekend by current students. Revisit the department's history with guests including Bill Nichols, Derek Redmond, and Clarke Mackey. Celebrate a half-century of Film Studies at Queen's! Remember the past, imagine the future! 6:00 pm-9:00 pm: Wine and Cheese Mixer and Premeire Party for the new Master's and PhD programs at the Isabel Bader Center for Performing Arts, 390 King Street West. The Kingston Film Office is offering registered Queen's Film and Media anniversary guests complimentary guided tours of Kingston Penitentary (Tickets usually cost $35). Over the weekend, two time slots for 90-minute tours are available for up to 30 guests each, on a first-come first-serve basis. The times are Saturday April 6 2019 at 10:00AM (before Anniversary events at the Isabel Bader Centre), and Sunday April 7 at 12:00PM (following brunch on your way home). If you've already registered for the weekend, email Denise Arsenault to indicate your preferred date and time for the tour. Can't Attend? Donate to imagine the future with Queen's Film and Media! Support our $50 for 50 campaign - donate $50 or $500 or more! Join us for the launch of the new Masters and Doctoral programs in Screen Culture and Curatorial Studies* on April 5 from 6:00-9:00PM. RSVP to the Premiere Party. Join us for a 30-minute webinar to learn about the new Master's and Doctoral Programs in Screen Culture and Curatorial Studies* this spring. Register for an information webinar. If you're a Studio Q/QTV alum, there's a reunion event on the Saturday evening after the Film and Media Anniversary Dinner. Register for the event.